Academic debates are ongoing regarding the relationship between air pollution, temperature and mortality in urban areas. This article reviews parallel developments in the analysis of the air pollution-heat-mortality relationship by examining the results from air pollution, bioclimatological and toxicological studies. It is shown that toxicology can provide a useful framework to connect air pollution and heat. However, it is argued that both air pollution and bioclimatological studies tend to emphasise either air pollutants or temperature, but not both, in the air pollution-heat-mortality relationship. Furthermore, some studies found no confounding effects of air pollution, whereas other studies discovered that air pollution is a confounder and air pollutants have a possible synergistic effect with temperature on mortality. This relationship also appears to differ in study locations. Consequently, further interdisciplinary research and communication are necessary to ensure a more holistic understanding of the air pollution-heat-mortality relationship. Heat-health relationships in urban areas have been studied extensively worldwide and these studies observed a U-, V- or J-shaped temperature-mortality relationship (Kunst et al., 1993: 334; Bell et al., 2008: 800; McMichael et al., 2008: 1126; Nicholls et al., 2008: 378; Zanobetti and Schwartz, 2008: 566; Chan et al., 2012: 323). The adverse effect of extreme heat on mortality is exemplified by the 2003 European heatwave (Robine et al., 2008: 172), when more than 70,000 additional deaths occurred because those people could not cope with the extreme heat (Robine et al., 2008: 177). The increasing frequency and intensity of heatwaves projected for the coming century (IPCC, 2013: 20) is an important health concern for policymakers as climate change can cause economic loss and adverse social impact (WHO, 2013a: 1). Air pollution's impact on mortality is another vital issue, especially for infants and the elderly (WHO, 2013a: 17). In particular, heatwaves are generally associated with poor air quality (IPCC, 2013: 957). Globally, a warming climate almost universally decreases baseline surface O3 but it increases O3 levels in some polluted regions and seasons (IPCC, 2013: 1000). Moreover, urbanisation increases the use of motor vehicles as well as industrial and commercial activities, leading to both higher CO2 emission and increasing air pollution (WHO, 2013a: 32). For example, air pollution is shown to cause about 200,000 early deaths per year in the USA (Caiazzo et al., 2013: 198). Reducing particular matter (PM10) from 70 to 20 µg/m3 is also shown to decrease the number of deaths related to poor air quality by about 15% (WHO, 2014). Morbidity such as respiratory and heart problems can be exacerbated by heat (Ye et al., 2012: 21) and air pollution (Schwartz et al., 2003: 31). However, morbidity is not the focus of this article as it is difficult to determine the exposure-response relationship and to recognise the roles of different pollutants on morbidity (Wong, 2014: 8). Some studies also use weekly or even monthly data which creates difficulty in understanding acute temperature effects on morbidity (Ye et al., 2012: 20). In brief, understanding the impact of extreme heat and air pollution on mortality can reduce premature deaths. Excess mortality occurs after a certain threshold temperature is reached, and excess mortality is the difference between observed mortality and baseline mortality (Gosling et al., 2009: 300). After the heat event, mortality rates reduce because the frail elderly die earlier than expected from heatwaves (Hajat et al., 2005: 613; Kinney et al., 2008: 89). Geographic location affects the threshold temperature as well. Specifically, it appears that the closer to the equator, the higher the threshold temperature becomes (Hajat and Kosatky, 2010: 757). This phenomenon is consistent in both Asian and North American studies (Curriero et al., 2002: 84; Kim et al., 2006: 269). To increase the complexity of this problem, study results are not consistent across geographic locations (Schwartz, 2005: 630; Pope and Dockery, 2006: 712). The air pollution-heat-mortality relationship might be location-specific. Geography is one of the missing pieces of the puzzle in understanding this relationship. Climate change also adds another dimension to the problem because it could change the exposure pattern and the exposure environment (WHO, 2013a: 14). Other than that, unmeasured confounders such as socio-economic factors are difficult to account for (Marra and Radice, 2011: 348). Confounders are variables that are related both to the outcome and exposure of interest, but that are not the cause of the outcome (Marra and Radice, 2011: 347). A population's behavioural responses under changing climate are critical for understanding the differences in results from different cities (Semenza et al., 2008: 485). Briefly, researchers should include these factors in analysing heat/air-pollution related health issues. An increase in mortality occurs when both temperature and air pollution levels are high in urban areas. Some researchers have argued that an increased exposure to heat is an important factor leading to increases in mortality (Braga et al., 2002: 859; Curriero et al., 2002: 80); whereas others placed a greater focus on the role of exposure to high levels of air pollutants on mortality rates (Katsouyanni et al., 1995: 1030; Samet et al., 2000a: 1742; Samet et al., 2000b: 8; Wong et al., 2008: 1195). Still other scholars have maintained that the combination of the two exposures leads to increased mortality (Katsouyanni et al., 2001: 530; Ren et al., 2006: 1695; Grass, 2008: 144; Pearce, 2011a: 134). These different viewpoints remain an issue of debate in academic literature. Against the backdrop of this debate, this article reviews parallel developments in analysing air pollution-heat-mortality relationships from different fields. Specifically, this article examines peer-review literature and reports dating mainly from after 1990 from air pollution studies, bioclimatological studies and toxicological studies. Toxicology is a discipline which has recently begun to contribute to the debate, concentrating on the dose-response relationship. For the purpose of this review, the article analyses the air pollution-heat-mortality relationships from a toxicological perspective. Air pollution and heat can be considered as toxicants to which humans are exposed. In this context, air pollution is a chemical agent whereas heat is a physical agent (Gregus, 2013: 50). Exposure to both toxicants will eventually lead to cellular dysfunction and, in extreme cases, death (Gregus, 2013: 50). The article focuses on PM10 as the major pollutant to study, because most weather stations have a reasonably complete dataset of PM10, but usually not of other air pollutants such as ozone and volatile organic compounds (Fuchs and Frank, 2002: 209). This focus allows an easier comparison between air pollution studies in different parts of the world. Air pollution can have both acute and chronic impact on health (Bell and Davis, 2001: 389), but the article focuses on the acute impact of air pollution as it interacts more closely with extreme heat events, which are usually short-term. What is the impact of air pollution on mortality? What is the impact of high temperature on mortality? How does the interaction between high temperature and air pollution affect mortality? This article argues that the discipline of the study and study methods affect the research focus of certain exposure components (see Figure 1). For example, it appears that air pollution studies place a greater focus on the role of air pollutants than weather components (Katsouyanni et al., 2001: 521; Schwartz, 2005: 627), whereas the opposite is true for bioclimatological studies (Curriero et al., 2002: 80; Analitis et al., 2014: 15). Tables 1 and 2 summarise the results from both air pollution and bioclimatological studies. With these kinds of discipline focus, toxicological studies have not been thoroughly considered until recently (Pope and Dockery, 2006: 731). More communication between different disciplines is necessary to ensure a holistic view of the issue. Figure 1: The parallel development of methodological approaches to research analysing high temperature, air pollution and mortality relationships (modified after Grass, 2008). Red arrows indicate relationships of primary interest. Purple arrows indicate relationships of secondary interest. The column called 'Toxicological Studies' has been added by the author. Reproduced with the kind permission of Dr David Grass. Vanos et al. (2014),1981-1999 10 major Canadian cities (Saint John, Toronto, Montreal, Ottawa, Windsor, Quebec City, Calgary, Edmonton, Winnipeg, and Vancouver) Spatial Synoptic Classification (SSC) system, CO, NO2, O3, and SO2 Mortality (total non-accidental, CVD and RD) [ICD-9] Time-series study (Poisson generalised linear models) Weather type and season modify the air pollution-mortality relationship. Cheng and Kan (2012), 2001-2004 Shanghai, China PM10, SO2, NO2, and O3, minimum, maximum, and mean temperature and relative humidity (weather stations) Mortality (all-cause, CVD and RD) [ICD-9] Time-series study (generalised additive model) A statistically significant interaction between PM10/O3 and extreme low temperatures was discovered for total non-accidental mortality. Pope and Dockery (2006), 1997-2005 U.S., Europe, Japan, South Korea PM10, PM2.5 and sulphate particles; temperature and humidity (weather stations) Mortality (all-causes, RD, CVD) [ICD-9] Meta-analysis of various studies Various combinations of air pollutants have impact on mortality. Temperature is treated as a confounder in the PM-mortality relationship. Schwartz (2005), 1986-1993 14 U.S. cities (Birmingham, Boulder, Canton, Chicago, Cincinnati, Colorado Springs, Columbus, Detroit, Houston, New Haven, Pittsburgh, Provo-Orem, Seattle, and Spokane) O3, temperature and humidity (weather stations) Non-accidental mortality Case-control study, regression splines Temperature is unlikely to confound the association between O3 and mortality. Roberts (2004), 1987–1994 Cook County, Illinois and Allegheny County, Pennsylvania PM10, temperature, dew point temperature (weather stations) Non-accidental mortality Time-series study (generalised linear model and generalised additive model) Possible interaction is found between particulate air pollution and temperature on mortality. Katsouyanni et al. (2001), 1990-1997 29 European Cities (Athens, Barcelona, Basel, Bilbao, Birmingham, Budapest, Cracow, Dublin, Erfurt, Geneva, Helsinki, Ljubljana, Lodz, London, Lyon, Madrid, Marseille, Milan, Paris, Poznan, Prague, Rome, Stockholm, Tel Aviv, Teplice, Torino, Valencia, Wroclaw, Zurich) PM10, NO2 and black smoke, as well as daily average temperature and relative humidity [Pollution and Health: A European Approach 2 (APHEA2) project] Mortality excluding external causes [ICD-9] Time-series study (generalised additive models extending Poisson regression) Both PM10 and black smoke can be used to predict daily mortality across Europe. Temperature and humidity modify the air pollution-mortality relationship. Samet et al. (1998), 1973-1980 Philadelphia, U.S. Total suspended particles and SO2 (weather stations); the Temporal Synoptic Index (TSI) and the Spatial Synoptic Classification (SSC) (Dr Lawrence Kalkstein, and Center for Climatic Research, University of Delaware) Mortality excluding external causes [ICD-8 and ICD-9] Time-series analysis (weather models and Poisson regression) There is little evidence that synoptic weather categories and weather conditions modify the air pollution-mortality relationship. Katsouyanni et al. (1993), 1981-1987 15 Greek cities (Athens, Arta, Florina, Hania, loannina, Iraklio, Kalamata, Kavala, Korinthos, Larisa, Patra, Seres, Thessaloniki, Trikala, and Tripoli) O3, smoke and SO2, temperature (weather stations) Two approaches: Excess total mortality, and mortality recorded by the authors (Athens Town Registry) Time-series study (multiple linear regression) There is a statistically significant result for the interaction between high levels of air pollution and high temperature. Lave and Seskin (1970), multiple studies from the 1940s to 1960s UK, U.S. and Japan Air pollution (deposit and smoke indices) Mortality (caused by bronchitis and lung cancer), and morbidity Literature review, simple linear relationship between air pollution and mortality There is a relationship between air pollution and mortality, but temperature is not considered in the study. Note on acronyms: CO: carbon monoxide; COPD: chronic obstructive pulmonary diseases; CVD: cardiovascular disease-related deaths; ICD-9: International Classification of Diseases, 9th Revision; PM10and PM2.5: particulate matter, 10 μm and 2.5 μm; O3: ozone; NO: nitric oxide, NO2: nitrogen dioxide; RD: respiratory disease-related deaths; SO2: sulphur dioxide. Analitis et al. (2014), 1990-2004 Nine European cities (Athens, Barcelona, Budapest, London, Milan, Munich, Paris, Rome, and Valencia) Heatwaves (derived from daily apparent temperature), SO2, PM10, NO2, O3, CO (weather stations) Mortality (all-causes, CVD, RD and cerebrovascular causes) [ICD-9] (EuroHEAT database) Time-series study (generalised estimating equation modelling approach) Air pollution has a role in modifying the effects of heatwaves on mortality. Grass and Cane (2008), 1988-1996 Santiago, Chile Temporal synoptic index, NO2 and PM10–2 .5 (weather stations) Mortality (all-cause, CVD and RD) [ICD-9] Time-series study (principal components and cluster analysis) Stressful weather conditions and pollutants might have a synergistic effect on total mortality and respiratory mortality. O'Neill et al. (2005), 1996-1999 Mexico City and Monterrey Apparent temperature (AT), PM10, O3 (weather stations) Mortality excluding external causes [ICD-9] Time-series study (robust Poisson regression) Air pollution is a confounder for the heat-mortality relationship. Rainham and Smoyer-Tomic (2003), 1980-1996 Toronto Humidex (weather station), O3, SO2, NO2, and CO (National Air Pollution Surveillance Network (NAPS) database) Mortality (combined cardiac and respiratory )[ICD-9] Time-series study (generalised additive linear model) Air pollution is a confounder for the heat-mortality relationship. Braga et al. (2002), 1986-1993 12 U.S. cities (Atlanta, Houston, Birmingham, Canton, Chicago, Colorado Springs, Detroit, Minneapolis, New Haven, Pittsburgh, and Spokane) Temperature and humidity (weather stations) Mortality (COPD, CVD, RD, and by pneumonia) [ICD-9] Time-series study (generalised additive Poisson regressions) There is no clear impact of humidity on mortality. Air pollution is excluded from the model as airborne particles are measured only one day in six in most U.S. cities. Curriero et al. (2002), 1973-1994 11 large eastern US cities (Chicago, Boston, New York; Philadelphia, Pennsylvania; Baltimore; Washington, DC; Charlotte; Atlanta; Jacksonville, Tampa, and Miami) Temperature and dew point temperature (weather stations) Mortality excluding external causes (specifically CVD, RD) [ICD-9] Time-series study (log-linear regression analysis) There is a strong association of the temperature-mortality relation with latitude. However, air pollution is not treated as a confounder in the study. Sartor 1995, 27 June to 7 August 1994 (heatwave) Belgium Temperature, relative humidity, O3, SO2, NO, NO2, suspended particles, (weather stations). Mortality (all-cause) (National Register) Time-series study (generalised least-squares method) There is a synergy between temperature and O3 in affecting all-cause mortality. 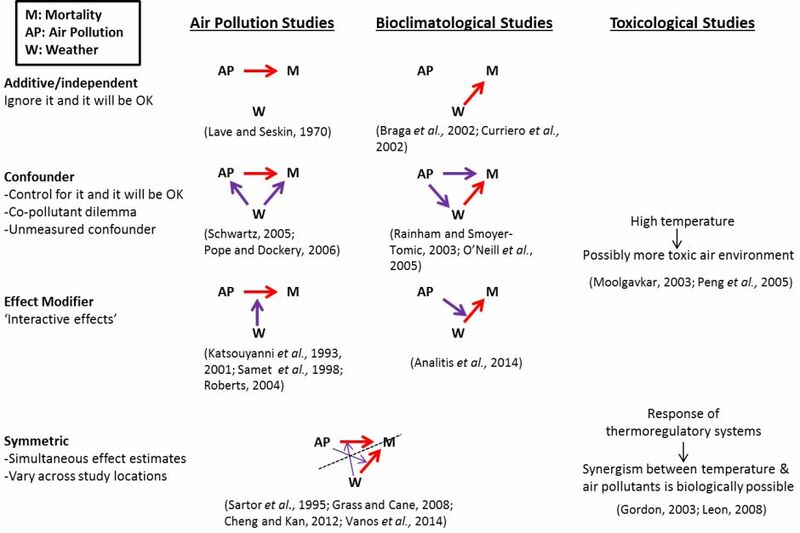 Toxicology provides a useful framework to connect air pollution and bioclimatoligical studies on the issue of heat-air pollution-mortality relationships. Toxicological studies are interested in the exposure/dose-response: specifically the physiological response to environmental toxicants, which is studied in animal models and on humans (Gregus, 2013: 49). In this case, the toxicants are air pollutants such as PM10. Episodes of air pollution can cause vulnerable individuals to die from asthma (mostly children without appropriate treatment) (WHO, 2013b) or a heart attack (mostly elderly) (Gold and Samet, 2013: e411). Figure 2 describes this relationship. Toxicants can enter the human body in three ways: via respiratory surfaces, via the gastrointestinal tract and via the skin (Lehman-McKeeman, 2013: 154). From a toxicologist's point of view temperature and air pollution act as a physical (Gordon and Leon, 2005: 237) and chemical (Costa and Gordon, 2013: 1245) agent respectively, and they both increase human exposure to environmental toxicants, leading to absorbed doses in a target organ (Geller and Zenick, 2005: 1258; Gordon and Leon, 2005: 237). Toxicants' biological systems are changed and result in a disease state (Gordon and Leon, 2005: 236). 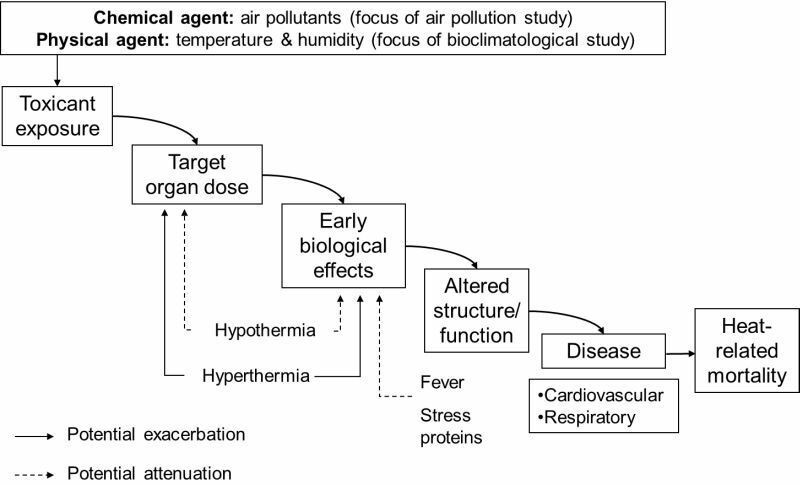 Temperature and air pollutants affect the target organ dose in two ways (see Figure 2). Firstly, high temperature increases respiratory rate and subsequently, airborne pollutant intake (Leon, 2008: 150). Specifically, this makes the skin more permeable and allows more pollutants to be absorbed by the body. Secondly, altered structures in the body such as the heat shock proteins increase the detrimental impacts of toxicants (Gordon and Leon, 2005: 237). In terms of age group differences, the thermoeffector mechanism of the elderly differs from that of younger people (Kenney and Munce, 2003: 2598). In terms of heat stress, they are impaired with regard to increasing sweat output and skin blood flow (Gordon, 2005: 200). Due to the deficiency of thermoregulation and other homeostatic processes in the elderly population, these people might suffer from changes in PM10 level (Frank and Tankersley, 2002: 61). Overall, the elderly have less ability to regulate their temperature, so they have higher mortality risks when they are exposed to high temperatures and air pollutants. Figure 2: Modification of the exposure-dose continuum taking into consideration the possible effects and consequences of heat stress and thermoregulatory responses (modified after Gordon and Leon, 2005). Reproduced with the kind permission of Dr Christopher J. Gordon. It has been suggested that inhaled PM can cause respiratory allergic responses in humans, as it has been observed in animals (Chow et al., 2006: 1369). There is also possible translocation of ultrafine PM, causing biological responses in non-respiratory tissues, such as the brain (Pope and Dockery, 2006: 728). In addition, there could be a possible synergy between high temperature and air pollutant exposures because the thermoregulatory system's response to heat stress can have direct or indirect effects on how toxicants enter the body (Gordon, 2003: 5). Moreover, it is possible that high temperature makes the composition of the air environment more toxic (Peng et al., 2005: 592). The chemical composition of the particles might change between seasons, but not necessarily due to the weather (Pearce, 2011a: 122). Particularly, the PM10 log relative rate is greater during spring and summer time in the United States (Peng et al., 2005: 592). There could be a non-linear toxicants' exposure-response relationship (Pearce, 2011a: 122). Peng et al. (2005: 592-93) also provided the following three competing hypotheses for this variation. Apart from the seasonal variation of PM10 constituents, there is differential seasonal exposure, leading to differences in the time people spend indoors or outdoors. Other than that, the particle effect becomes more apparent in summer time when infectious diseases are less prevalent. Furthermore, this seasonal variation can be attributable to yet-to-identified sources and co-pollutant can act as a confounder (Pearce, 2011a: 122). Further research to identify source exposure bias would be beneficial. In short, many concepts in toxicology can be adapted to both air pollution and bioclimatological studies. There are consistent results across different continents on the air pollution-mortality relationship (Katsouyanni et al., 2001: 528; Pope and Dockery, 2006: 713). In the northern hemisphere two comprehensive, population-level epidemiological studies were conducted. The National Morbidity and Mortality Air Pollution Study (NMMAPS) was conducted in the United States (Samet et al., 2000c: 8); whereas the Air Pollution and Health: A European Approach (APHEA) study was conducted in Europe (Katsouyanni et al., 1995: 1032). Particulate matter (PM) air pollution is 'an air-suspended mixture of solid and liquid particles that vary in number, size, shape, surface area, chemical composition, solubility, and origin' (Pope and Dockery, 2006: 730). Samet et al. (2000c: 21) discovered consistent results in 90 cities with every 10 µg/m3 increase in PM10 resulting in an average approximate 0.5% increase in overall mortality at one day after exposure (lag day 1). In phase two of APHEA (APHEA2), Katsouyanni et al. (2001: 522) studied 29 cities in Europe. Their results agreed with Samet et al. (2000c: 21). In these 29 cities, there is approximately a 0.6% (95% CI: 0.4-0.8%) increase in mortality across all ages for a 10 µg/m3 increase in daily PM10 or black smoke concentrations (Katsouyanni et al., 2001: 525). The results of these two studies are combined in Katsouyanni et al. (2009: 1), with new, similar PM10-mortality relationship obtained in 12 Canadian cities. More recently, Public Health and Air Pollution in Asia (PAPA) investigated the effects of air pollution on human health in four Asian cities (Bangkok, Hong Kong, Shanghai and Wuhan) (Health Effects Institute, 2010: 3-4). Health Effects Institute (2010: 7) further established the PM10-mortality relationship in the Asian context. In combining the results of four cities, there was a 0.6% (95% CI, 0.3-0.9%) increase in mortality with a 10 µg/m3 increase in daily PM10 (Health Effects Institute, 2010: 7). Overall, it demonstrates that PM10-mortality relationship is well established. Air pollution studies have an inherent focus on the role of air pollutants on human health. These studies often treat temperature as a confounder (Samet et al., 1998: 9; Schwartz, 2005: 627). Temperature is linked to air pollution (the exposure of interest) (Camalier et al., 2007: 7127; Jacob and Winner, 2009: 52; Pearce, 2011a: 6), and mortality (the outcome of interest) (McMichael et al., 2008: 1122-23). The interest in temperature as a confounder increased when seasonal differences were observed in pollutants' impacts on health (Peng et al., 2005: 588). Weather changes the concentrations of urban pollutants (Elminir, 2005: 232-235). On the one hand, some studies claimed that there is greater influence of air pollutants on human health during warmer months in Western Europe (Nawrot et al., 2007: 148). On the other hand, Wong et al. (2001: 337) stated that there was a higher level of air pollutants during the cool (October to March) season in Hong Kong. Consequently, the effect of air pollutants on cardiovascular and respiratory diseases is higher in the cool season in Hong Kong (Wong et al., 2001: 337). While this research implied that air pollutants were possibly more harmful to human health in certain months, others argued that the higher mortality which was observed was due to seasonal variations in people's behaviour (Hänninen and Jantunen, 2007: 838). Stafoggia et al. (2008: 1477) agreed, stating examples such as increased exposure during warm periods (more time being spent outdoors, household windows being opened). In brief, temperature could modify the influence of pollutants or change people's behaviour. There could be interaction among different pollutants, and between pollutants and temperature. One concern in air pollution studies is the 'co-pollutant' dilemma (Chow et al., 2006: 1370). It refers to the difficulty of explaining the effects of air pollution between PM and non-PM components, many of which are rarely measured (Chow et al., 2006: 1370). It appears that non-PM components of combustion emissions can lead to some of the health effects which can also be caused by PM (Chow et al., 2006: 1370). Other than that, it is unclear whether certain sources and combinations of air pollutants are most responsible for causing health effects in humans (Pope and Dockery, 2006: 732). Another concern is the high correlation between air pollution and temperature (Camalier et al., 2007: 7130-31; Carslaw et al., 2007: 5295; Pearce et al., 2011b: 1332). Since air pollution is so closely related to temperature, removing one variable (air pollutants or temperature) could reduce the effect of the other variable substantially (Pearce, 2011a: 123). For example, temperature drives photo oxidant generation, and ozone concentrations are greater in warmer temperatures, though ozone and temperature are not always highly collinear (Pearce, 2011a: 123). Ozone data is sometimes difficult to be accounted for because of data unavailability (Guo et al., 2011: 1724). In Wuhan, China, Qian et al. (2008: 1176) discovered a synergistic effect between temperature and PM10, which supported the result by Ren and Tong (2006: 90) and Stafoggia et al. (2008: 1483). Further research is required to understand how air pollutants interact to produce health effects on humans. There is a growing body of research on the heat-health relationship. In particular, it is controversial whether air pollution is a confounder in the temperature-mortality relationship (O'Neill et al., 2003: 1075; Rainham and Smoyer-Tomic, 2003: 9; Basu et al., 2008: 138; Kinney et al., 2008: 89; Hajat and Kosatky, 2010: 758). Some studies such as Braga et al. (2002: 859) and Curriero et al. (2002: 81) ignored or downplayed the role of air pollution as a confounder in heat-mortality relationship. Other studies found that ozone and particulate matter are associated with mortality and coupled with high temperature (Ha et al., 2011: 3279). However, other atmospheric nanoparticles might not have similar effects (Kim and Joh, 2006: 87). Tan et al. (2007: 199) discovered that the magnitude of temperature-mortality relationship is greater than that between air pollution and mortality. Other than that, Basu et al. (2008: 144) contended that air pollution is not a confounder in heat effects on human health. In analysing the general population's excess mortality in South Korea, Kim and Joh (2006: 87) did not find significant differences between the relative risk rates with control for air pollutants and those without control for air pollutants. In contrast, other studies stated that air pollution was a confounder (Rainham and Smoyer-Tomic, 2003: 12; O'Neill et al., 2005: 127). In examining the association between humidex and mortality in summer for Toronto, Rainham and Smoyer-Tomic (2003: 15) compared different groups of people (male, female, people older or younger than 65 years old and people with cardiovascular diseases). They discovered that the models controlling for air pollution had lower relative risk estimates for all groups except females. The relative risk in the 50–95th percentile analysis decreased up to 1.71% (Rainham and Smoyer-Tomic, 2003: 14). In Mexico City, the percentage increase in daily mortality in children (0-15 years) was nearly twice as large in the model without control for pollution and epidemics [19.7% (95% CI: 13.9%, 25.9)], compared with the adjusted model [10.9% (95% CI: 5.4%, 16.7%)] (O'Neill et al., 2005: 121). Zanobetti and Schwartz (2008: 567) claimed that ozone could be a confounder in heat-health relationships, but with minimal effect modification. Ren et al. (2008: 255) agreed. In the U.S., Anderson and Bell (2009: 208) found that ozone reduced hot effects slightly. Other researchers suggested a synergistic effect between air pollution and temperature (Park et al., 2011: 368). Analitis et al. (2014: 15) also discovered that stronger heatwave effects on total and cardiovascular mortality were observed on high ozone and high PM10 days. Nevertheless, Hales et al. (2000: 89) did not observe interaction between PM and temperature on mortality. In short, there appears to be an effect modification, or even synergistic effect between temperature and air pollution on human health. In order to gain an understanding on this synergistic relationship, the climatological processes of how temperature drives the generation of air pollution needs to be understood. As mentioned above, many bioclimatological studies treat air pollution as a confounder in the heat-health relationship. Perhaps an interactive view between temperature and air pollutants is more appropriate. Temperature is significant to air pollution meteorology for three reasons. First, surface temperatures influence the boundary layer base heights (Hewitt and Jackson, 2009: 218). High surface temperatures lead to high boundary layer base height and high mixing depths; low pollution mixing ratios is the result (Hewitt and Jackson, 2009: 240). Second, surface temperatures impact on wind speeds. For example, a warm surface temperature enhances convection – vertical air circulation due to cool air sinking and warm air rising, which increases vertical mixing and leads to stronger surface winds (Pearce, 2011a: 29). Faster near-surface winds can result in greater dispersion of near-surface pollutants or increase the re-suspension of loose soil dust and other aerosol particles from the ground (Jacobson, 2002: 169). Low-pressure systems (hot weather) enhance convection, the dispersion of near surface pollution via horizontal and upward vertical transport (Jacobson 2002: 156). In summary, higher mixing depth increases vertical mixing, and consequently this increases the rates of air pollution dispersion. Third, surface temperatures are often associated with solar radiation levels, which drive photochemical reactions (Hewitt and Jackson, 2009: 200) For instance, near-surface air temperatures affect the rates of chemical reactions, anthropogenic volatile organic compound (VOC) emissions, biogenic emissions, and aerosol thermodynamics (Environmental Protection Agency, 2009: 3-4). Saturation vapour pressure increases with increasing temperature, and more vapours of a trace gas can be held in the atmosphere (Raval and Ramanathan, 1989: 761). The above process is a key driver of air pollution (Environmental Protection Agency, 2009: 1-6). In particular, secondary pollutants such as ozone and other photochemical oxidants are produced through chemical reactions from primary pollutants which are temperature sensitive (Dawson et al., 2009: 1). In summary, a simplistic view of treating air pollution as a confounder might not be adequate to address the temperature-mortality relationship. Climate change may alter air quality and change the impact of air pollution on human health (Park et al., 2011: 368). It also affects the frequency of heat events (Bernard et al., 2001: 200; Takahashi et al., 2007: 340). Cifuentes et al. (2001: 419) stated that better air quality lessens the impact of climate change on human mortality. In particular, climate change changes pollutants' dispersion, mixture, and generation, as well as the strength of emission and the rate of anthropogenic emissions (Bernard et al., 2001: 208; Jacob and Winner, 2009: 52). These factors alter the exposure environment. In addition, climate change modifies human exposure by changing human behaviour, as well as adaptive measures (Bernard et al., 2001: 199). In short, climate change alters the air pollutant exposure patterns and environment. In addition to the differences in conceptual frameworks in tackling temperature-air pollutant-mortality relationships, geographic variation creates a new layer of complexity. For example, heat-health outcomes are different across cities along similar latitudes (Chung et al., 2009: 390). As noted above, some studies consider air pollutants as a confounder (Rainham and Smoyer-Tomic, 2003: 12; O'Neill et al., 2005: 127), while others do not (Braga et al., 2002: 859; Curriero et al., 2002: 81). Apart from confounders, socio-economic factors influence the population's health status, the prevalence of chronic diseases, and the adaptability of people living in various cities (Loughnan et al., 2010: 12; Analitis et al., 2014: 21). Heat-susceptible populations could also be prone to air pollution, and vice versa (Analitis et al., 2014: 21). Another factor is the topography of the study location and urban geometry and building materials (Giridharan et al., 2005: 964). Understanding the dynamics of vulnerable population can explain the differences in the results obtained from various countries. It is problematic to account for unmeasured confounders because researchers are dealing with factors that are unknown, but are related to mortality increase (Marra and Radice, 2011: 348). Schwartz et al. (2003: 40) and Pope and Burnett (2007: 424) argued that behavioural and socio-economic factors are unlikely to confound heat-health relationships, because these factors vary little on a day-to-day basis. Nevertheless, as discussed above, people's behaviour varies across seasons and subsequently the amount of exposure to air pollutants changes. Apart from the exposure to air pollutants, people living alone also increases the risk of insufficient time to ask for help when they suffer from heat-related illnesses (Hajat and Kosatky, 2010: 757). Stürmer et al. (2007: 4) suggested that additional data can be collected for a subgroup of study population to include more possible confounders. In this way, internal validation studies could be used to address the unmeasured confounders in the main study (Stürmer et al., 2007: 4). The methodological approaches for understanding the relationships between air pollution, temperature and mortality have undergone several stages of development. Some studies ignore either the effect of weather (Lave and Seskin, 1970: 723) or air pollution (Curriero et al., 2002: 81) on human mortality. This view is undermined by the studies of other scholars, who treat weather (Pope and Dockery, 2006: 713) or air pollution (O'Neill et al., 2005: 127) as a confounder. In other words, air pollution or weather is treated as a factor to be controlled for, but this viewpoint differs from scholars who treat these two factors as effect modifiers. Effect modifiers describe an interactive effect: the way weather changes the air pollution-mortality relationship (Katsouyanni et al., 2001: 527; Ren and Tong, 2006: 94) or the way air pollution influences the heat-mortality relationship (Analitis et al., 2014: 15). Still, the emphasis is placed on the effect of either air pollutants (air pollution studies), or weather (bioclimatological studies) on mortality. Other researchers speculated a simultaneous effect between air pollution and weather on mortality (Goodman et al., 2004: 184; Grass and Cane, 2008: 1124). This effect can be additive, antagonistic or synergistic (Grass and Cane, 2008: 1113). Buckley et al. (2014: 243) go further and suggest that temperature and air pollution could have a shared cause such as the movement of air masses and other weather phenomena, which could be difficult to measure. Climate change could increase the concentration of tropospheric ozone in high-income countries, but the evidence is less robust for PM due to limited studies (Ebi and McGregor, 2008: 1449). It appears that there are limitations in research design as articles are usually tailored for submission to journals within a specific discipline (Campbell, 2005: 574). For example, an article submitted to a climatology journal might stress the importance of a weather index, and downplay the role of toxicants. However, a multidisciplinary journal could potentially overcome this issue (Turner and Carpenter, 1999: 275). Toxicology contributes to issues related to 'biological plausibility and mechanisms' (Chow et al., 2006: 1378), and concerns the human body's responses to toxicant exposure (Gordon and Leon, 2005: 237). Scholars from the air pollution and bioclimatology fields recently appreciated the importance of toxicology in this debate. There are inconsistent results describing the role of air pollution on heat-related mortality across various study locations (Rainham and Smoyer-Tomic, 2003: 9; O'Neill et al., 2005: 127; Filleul et al., 2006: 1344; Stafoggia, 2006: 1483; Basu et al., 2008: 138; Bell et al., 2008: 796; Vaneckova et al., 2008: 361; Zanobetti and Schwartz, 2008: 563). Since researchers have restricted time and funding, inter-city and longitudinal studies are difficult to conduct. It can also be problematic to compare study findings as they use different study designs and temperature metrics. In summary, air pollution, bioclimatological and toxicological studies each view the air pollution-heat-mortality issue from a different perspective. There are debates in academic literature regarding the relationship between air pollution, temperature and mortality. Some studies found no confounding effects of air pollution (Basu et al., 2008: 144), whereas other studies discovered that air pollution is a confounder (Kim and Joh, 2006: 87) and air pollutants have possible synergistic effect with temperature on mortality (Qian et al., 2008: 1176). More interdisciplinary interactions between researchers from various fields are necessary to ensure a holistic approach to analyse the issue. This article has examined the literature on the impact of air pollution on heat-health relationships in urban areas. It started by linking air-pollution and bioclimatological studies from a toxicological perspective. After that it examined the relationship between air pollution, high temperature and mortality from air pollution and bioclimatological studies. Understanding this relationship is important because it influences the mortality rate in extreme weather conditions. It is simplistic to argue that there is a unidirectional influence of air pollution on heat-health relationships. Moreover, there are conflicting findings in academic literature from different fields regarding this relationship. Some studies found that air pollution is not a confounder; other studies maintained that air pollution is a confounder, or even interacts with temperature. Furthermore, this relationship differs in study locations. These findings support the article's contention that the discipline of the study tends to place a greater focus on either air pollutants or temperature on mortality. Toxicology joined the debate recently to contribute to human biological responses to toxicant exposures, seeing both air pollutants and heat as toxicants to be considered in the air pollution-heat-mortality relationships. In order to gain a holistic view on the issue, interdisciplinary research and communication are essential. The issue of reducing heat or air pollution-related mortality remains of great importance to policy-makers. Furthermore, health co-benefits can result as policymakers reduce air pollution and greenhouse gas emission together. Future research could examine in more detail the synergistic relationship between air pollutants and high temperature on mortality. Researchers can compare the results across various study locations, especially in the low- and middle-income countries as limited studies were conducted in those places. I would like to thank the three anonymous reviewers and my supervisor Dr Margaret Loughnan for providing useful feedback for my draft. Figure 1: The parallel development of methodological approaches to research analysing temperature, air pollution and human health relationships (modified after Grass, 2008). Red arrows indicate relationships of primary interest. Purple arrows indicate relationships of secondary interest. The column called 'Toxicological Studies' has been added by the author. Reproduced with the kind permission of Dr David Grass. Cho Kwong Charlie Lam graduated from Monash University in 2012 with a First Class honours degree in Geography. At the moment he is studying his PhD in Geography at Monash University. His current research investigates the impact of heat on visitors' human thermal comfort in Melbourne's botanic gardens during summer. To cite this paper please use the following details: Lam, C.K.C (2014), 'Air Pollution, Heat and Mortality in Urban Populations', Reinvention: an International Journal of Undergraduate Research, Volume 7, Issue 1, http://www.warwick.ac.uk/reinventionjournal/issues/volume7issue1/hong Date accessed [insert date]. If you cite this article or use it in any teaching or other related activities please let us know by e-mailing us at Reinventionjournal at warwick dot ac dot uk.